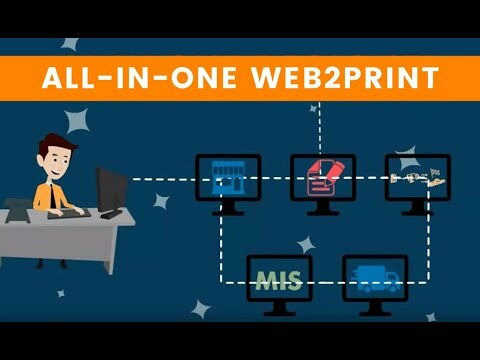 All-In-One Designer is a complete B2B and B2C web-to-print storefront solution with a fully responsive design tool, configurable print workflow, and print MIS. The cloud-based tool can be configured, scaled and customized to suit any type of print business needs including commercial printers, in-plant, digital printers, print brokers, speciality printers, and more. All-In-One Designer by Design’N’Buy aims to help print businesses to simplify order processing, storefront management, product design, and printing with a range of integrated tools. Powered by Magento, the B2C and B2B storefront management tools within All-In-One Designer allow businesses to create a unique, branded online page for selling their prints and offer tools for configuring language, layout, theme, payment gateways, shipping options, and more. Businesses can create an online product catalog to sell, up-sell, and cross-sell items and the catalog can be browsed by customers using smart search, product comparisons, filtering, reviews, ratings, and more. Users can manage sales to corporations as well as individual customers, and All-In-One Designer facilitates this by allowing users to create an unlimited number of private storefronts, sell stock in bulk, and manage corporate-specific parameters for pricing and payments. The All-In-One Designer design studio offers users a platform for creating custom print-ready designs, with self-service tools for allowing customers to create and proof their own designs for printing. Within the design studio, both businesses and their clients can create custom content for print with tools including layering, clipart, image upload, image effects, text, QR code embedding, live pricing, and more. The WYSIWYG editor allows users to create 2D and 3D images and preview the final product as they are working. Users are able to create design templates for common print types within All-In-One Designer which can be customized by clients for quick creation. The platform also offers a quick editor tools which automatically creates products using data gathered from an online form, meaning clients can create products on-the-go using just a mobile device. The ability to offer an online design tool to my customers that hands down beats them all is what I love best. I have more customers tell me how fun is is to use this tool once they understand how it works, and the learning curve is low. It does everything I was told it would do and then some! My favorite thing is the interface itself, I believe it's the best looking online design tool and has more features than anything I've found on the market today, plus the built in design guide help page is great. It does everything I was told it would do and then some! My favorite thing is the interface itself, I believe it's the best looking online design tool and has more features than anything I've found on the market today, plus the built in design guide help page is great. The one thing I would like to see is type strokes on the outside of the letters not just center, but this is really an Inkscape issue and not an AIOD issue. I just make adjustments on my end after downloading the output file. After reviewing many solutions to introduce our digitally printed products online, Design N Buy offered us more out of the box features than their competitors. Now after getting our site up live I am impressed that my long list of customization's was addressed without hesitation. Although It has been over a year working with rep I am still treated as if I was a new customer. Returning customers who would like to reorder can only view and edit the first page image in a multiple page product from previous orders. Hopefully this can be resolved. Olways have ggod conection with support team but sometimes it take long time for ipgrade exzisted software by their team. Make sure that you have patience. I am happy that I have all in one product design software which is design and developed by designnbuy. All my customers are very happy using this tool. The all in one product design software is the perfect solution for online printing and designing the T-shirt. Its user friendly. The all in one product design software is the perfect solution for online printing and designing the T-shirt. Its user friendly. I have not seen or found any disadvantage since I am using these software. All-In-One Designer Hosted: starting from $230/month. Contact Design'N'Buy for detailed pricing information. Allow personalization of any product including merchandise such as t-shirts and mugs, to wide format, 3D products, photo products, and more, all of which can be custom designed using All-In-One Designer. Benefit from All-In-One Designer’s robust print workflow and MIS which allows users to manage processes including quotations, print ordering, approval workflows, job sheet creation, production, shipment, and more. Create unique, custom prints within the Design Studio which offers tools for editing text, images, colors, effects, layers, and more. Live pricing gives users a real-time price estimate as they are working. Build and manage custom, branded B2B and B2C storefronts within All-In-One Designer and create a full product catalog for customers to browse online and place orders. Integrate with a range of third party apps for CRM, cloud storage, Print MIS, accounting, live chat, marketing, and more, including Netsuite, Zoho CRM, Salesforce, Dropbox, Olark, Instagram, and more. Below are some frequently asked questions for All-In-One Designer. Q. What type of pricing plans does All-In-One Designer offer? Q. Who are the typical users of All-In-One Designer? Q. What languages does All-In-One Designer support? Q. Does All-In-One Designer support mobile devices? Q. Does All-In-One Designer offer an API? No, All-In-One Designer does not have an API available. Q. What other apps does All-In-One Designer integrate with? Q. What level of support does All-In-One Designer offer?